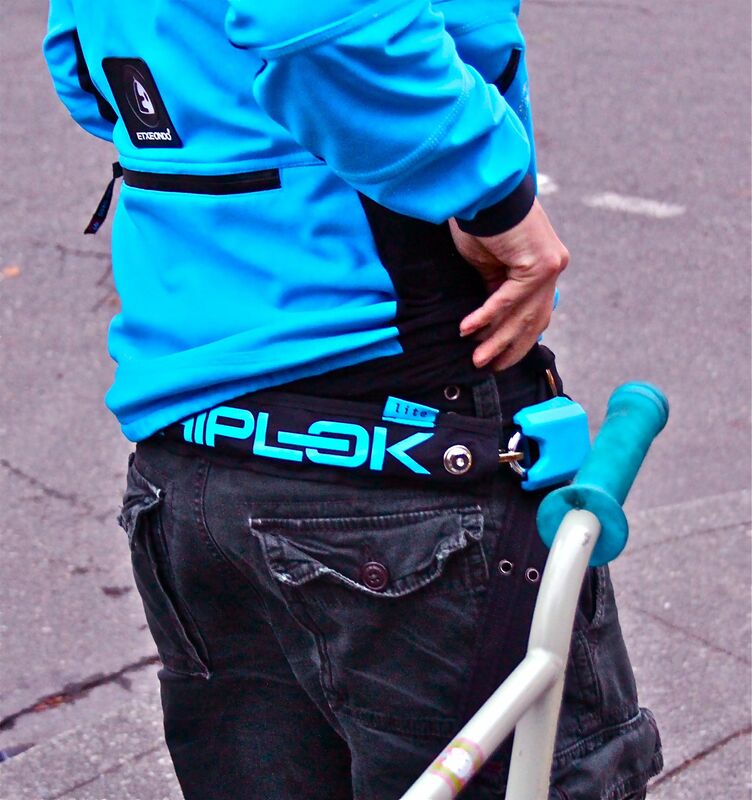 EXACTLY one year ago I reviewed the Hiplok, a cleverly designed chain lock from the UK that can be conveniently and comfortably worn around the waist. This time I’m writing about Hiplok Lite, a newer, lighter addition to the product line. The Hiplok Lite is essentially a scaled down version the original and shares all the basic attributes I described about the original. For those who want the raw numbers, the Hiplok Lite weighs only 1010gr versus the older Hiplok’s 1750gr. The Lite’s 66cm chain has square-section links 6mm on a side, while the original’s 82cm length has 8mm links. The Lite’s lock/buckle is also smaller. So the Hiplok Lite is obviously lighter, but because the lock and chain links are daintier one can naturally assume that the new lock trades away some security compared to the bigger version. According to Sold Secure, the new lock rates bronze versus a silver rating for the larger Hiplok. However, the Hiplok Lite is more than enough except in high risk areas where serious thieves operate. It’s not just the reduced weight that is a benefit; the smaller bulk is more comfortable if you ride in a tight tuck with low handlebars, or if you’re just a smaller rider. 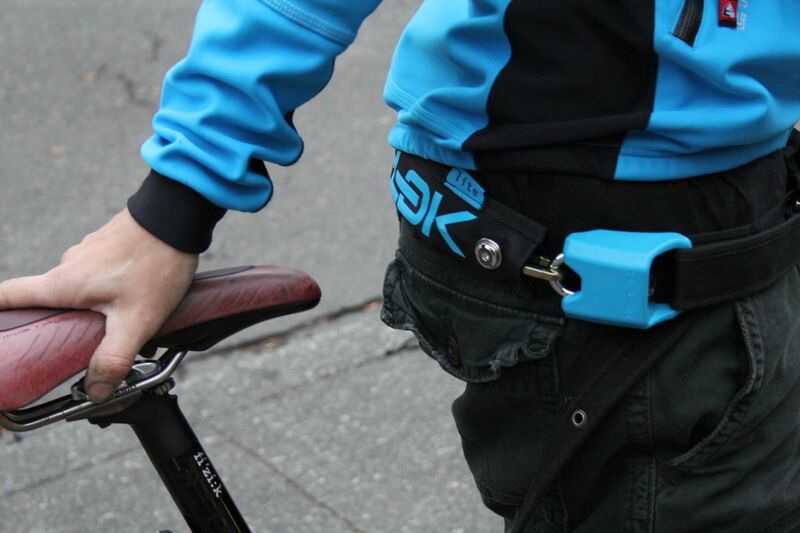 Still, the extra length of the original Hiplok is nice if you are locking up more than one bike. Oh, either Hiplok fit waists bigger than the length of the chain, but the Lite version does fit a range of waist smaller than the larger lock. Actually, the larger Hiplok is now the V1.5, but it still goes for an msrp of $100 in the states, while the Hiplok Lite retails for a very attractive $65. I now own both sizes of Hiplok and use them about equally. 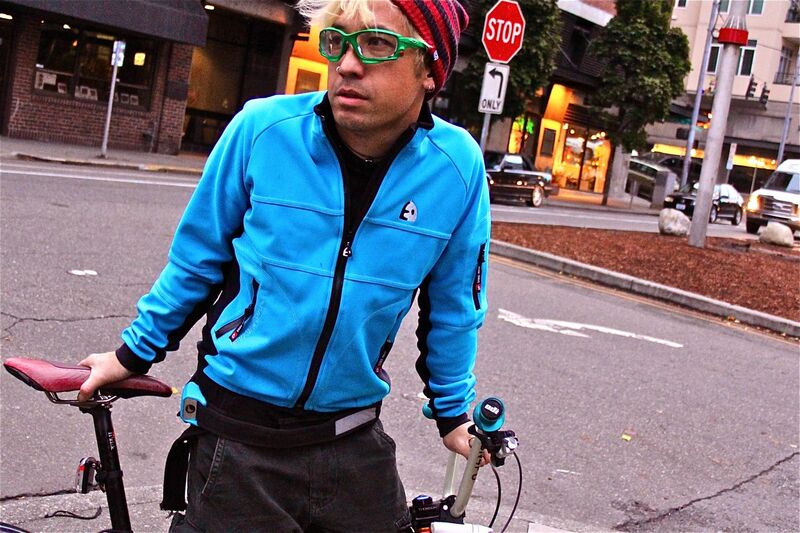 I’m having a hard time recommending one above the other, yet it sounds too wishy-washy to say “buy them both.” But if I had to choose one, then based on my size, riding style, and the level of risk where I park my bike, I’d choose the Hiplok Lite because of it’s smaller and less expensive. Having both versions, I can just grab the heavier, longer lock when I’m locking up a companion’s bike too or if I’m feeling paranoid about my destination.